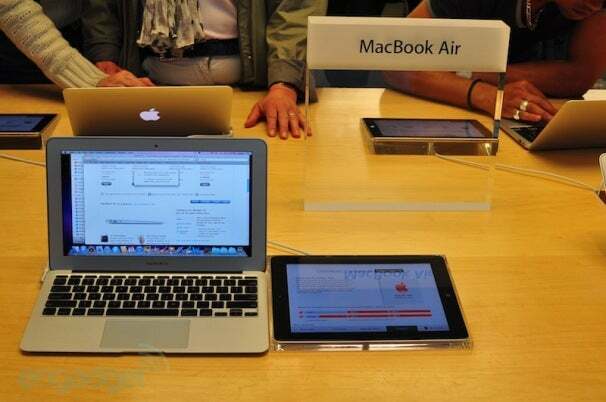 Apple In-Store iPads: Good or Bad? Now that Apple has unveiled its much-discussed retail upgrade--it's now using iPads as interactive product kiosks in its brick-and-mortar stores--customers are weighing in on the pros and cons of the new touchscreen brochures. Each Apple Store display unit, be it an iPhone, iPad, iPod touch, or Mac, has (or will soon have) an accompanying iPad 2 by its side. The companion tablet displays information about the product, as well as pricing, and includes a tab for summoning an in-store customer service rep. The photo below, taken yesterday by Engadget at the Apple Store on 5th Avenue in New York City, shows how the iPads are used to provide product information. So what do Apple customers think of the iPad kiosks? It's a bit early to tell, of course, but early responses on message boards are mixed. Some commenters point out the cruel irony of Apple Stores filled with display iPads--but stocking only a few that customers can buy and take home that day. "Imagine walking into an Apple Store wanting to buy an iPad 2, only to be turned away for a couple weeks and having to walk past all those iPad 2s being used to give you a price, details, and comparisons," writes Apple Insider reader "KrakaJap." "I, for one, would be rather annoyed." Macworld reader "MacAndre" makes a similar point: "Wow, now I know why it has been impossible to get any Wi-Fi-only iPad 2s around here for the last week or two; they all went into the Apple Store displays..."
Ticonderoga Securities analyst Brian White says the iPad 2 interactive displays will help Apple save money by reducing printing and paper costs. But some readers worry about the environment impact of those iPad kiosks running non-stop during business hours. "The printed paper (brochures) they used to have was more eco than these iPads! Hey Apple, wake up, are you still going green?" writes Macworld reader "TahitiEcotourism." The iPad kiosks may be hard for some customers to access too. "Are those iPad kiosk displays 'locked in,' as in, you can't pick them up?" asks Engadget reader "Jason." "As a wheelchair user, I'm already pre-pissed off before I see them in person... at least (with) the old info cards I could grab them to read." 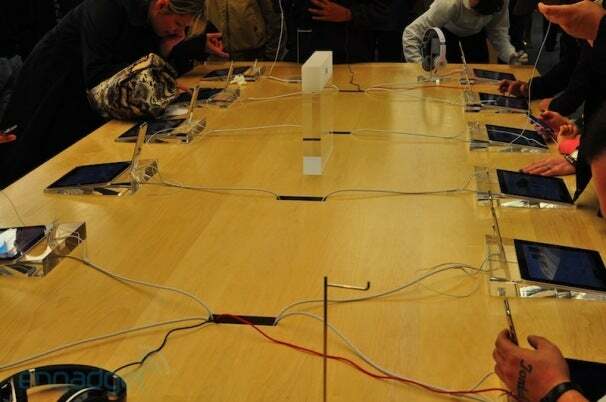 And finally, some readers question the aesthetics of iPad kiosks, each with unsightly cables that mar the minimalist beauty of the Apple Store. "What a disgusting display of cables. They should be ashamed," writes Engadget reader Kevin O'Neill. Some Apple fans, of course, like what they see. "Very cool. I'll have to make a trip to my local store and see these things firsthand," writes reader "danw12321" in the Macworld Community forum. So, what's you're take on the iPad kiosks? Good, bad, or whatever?